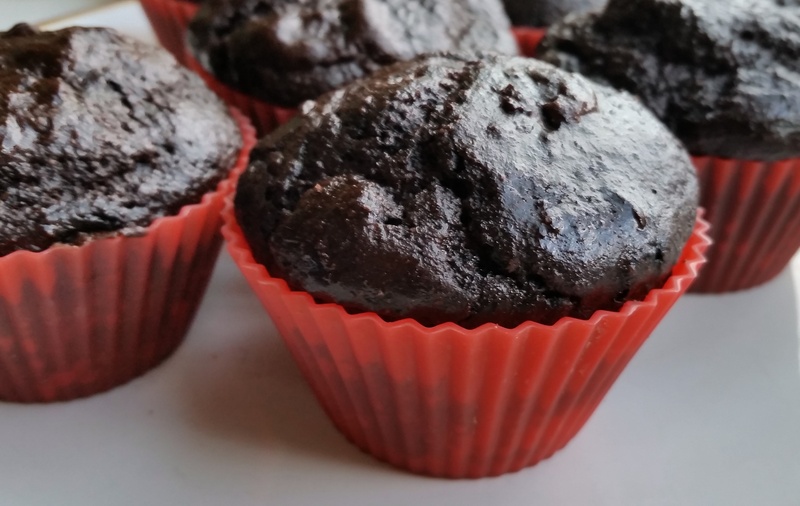 Inspired by the protein powder, I developed a recipe that was overall higher in protein than your typical muffin by also including chickpea flour (in addition to whole wheat), eggs, and yogurt as ingredients. If you don’t have protein powder, replace the 1/4 cup in the recipe with 3 tablespoons of a flour of your choice, a teaspoon of sweetener, and two teaspoons cocoa powder. Mix sweetener and flax with wet ingredients (pumpkin, applesauce, oil, vanilla, Amarula, yogurts, egg) together. Mix together flours, cocoa, whey powder, coffee powder, baking soda, and baking powder. Mix in an optional ½ teaspoon salt, then gradually stir in the wet ingredients. Batter should be somewhat lumpy.